Fraser Island sits at the bottom of the Great Barrier Reef and is the largest sand island in the world. 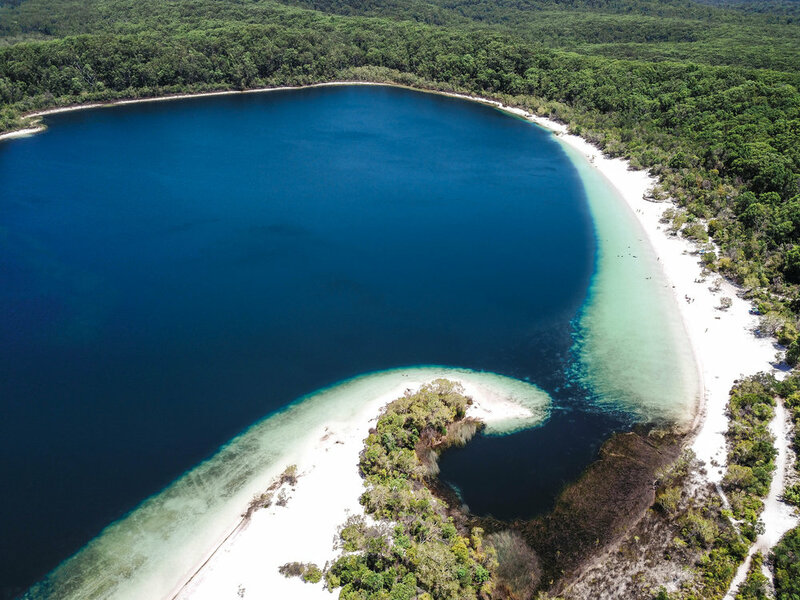 This unique island offers a great adventure to explore its exceptional formations, beautiful rainforests, magnificent vegetated sand dunes, incredible wildlife (birds, wallabies, sugar gliders, possums, dingoes...) and crystal clear mirror lakes. You will be amazed by all the wonderful places that you'll discover on Fraser Island and will be completely blown away by its wild side. A girl I met whilst travelling in Western Australia told me not to miss the Cool Dingo Tour on Fraser Island and she was right because the whole organisation was great and the staff were extremely friendly. The company offers several tours but I highly recommend going on the 3-day tour to get a good insight into the island. At first, I was a bit sceptical about doing the tour on a bus instead of driving my own 4x4 but the sand roads on the island are no joke and I'm not sure I'd feel confident enough to drive around all the narrow bumpy tracks anyway. We came across several people who got stuck in the sand and had to wait ages for them to get unstuck to be able to continue our route. Plus, our driver Megan was really funny and gave us lots of interesting facts about the island - which of course helped me in writing this post. After we all checked in at the main ticket office at River Heads, a bus drove us to the port to get the ferry barge across to Fraser Island (45mins crossing). Once on the island, the tour started with a 4x4 bus drive on a bumpy sand road to Lake McKenzie. This fresh water lake perched high on golden dunes was formed by rain water and sits 90m above sea level. The sand is bright white and really fine - you feel as though you're on the beach and forget that you're actually by a lake until you swim in the water and realise that it's not salty. This lake was one of my highlights of the tour! We then head a little buffet lunch and after went on a 5km rainforest walk from Basin Lake to Central Station passing by Wanggoolba Creek. This rainforest is unique in the world as it's the only one to grow on sand, at elevations of over 200 metres!! In the evening, I checked into the four-star Kingfisher Bay Resort - you can upgrade to the resort instead of staying at the dorms if you want some luxury. The resort is a beautiful eco lodge with a spa and large outdoor heated pool. My suite was clean and spacious and had a terrace with a beautiful view over the Wallum wetlands and the beach in a far distance. That evening, I had a lovely dinner at the Seabelle Restaurant. The chef uses local products mixed with plants and herbs picked daily at the resort, such as lemon myrtle. I tried crocodile for the first time ever and had a delicious barramundi cooked in paperbark. I enjoyed a buffet breakfast at the resort before we started our second day adventure at 7:30am. We drove all the way to Eurong on the east side of the island to reach the famous 75 Mile Beach. Due to its length, this beach also serves as a highway and a runway for the small planes. I couldn't resist going on the scenic flight with Air Fraser over the island on a small 8-seater plane. This 15 mins flight is optional but I highly recommend doing it to see all the secret spots of the island from above. We then drove up to the Champagne Pools (my favourite place on the island) which are really nice to have a dip - they're named this way because the waves hit against the volcanic rocks and create lots of bubbles in the pools of water. After that, we had a picnic lunch on the beach before going up to Indian Head to see the magnificent views of the two neighbouring beaches. The day ended with a stop at the Maheno Shipwreck and a fun swim along Elia Creek. I spent the evening chilling at the resort and had a nice dinner at the Maheno Restaurant. On our last day, the tour started at 7:30am with a long drive back up to Eurong to go to Lake Birrabeen. At this beautiful lake, we went swimming, paddle boarding and played several ball games in the water. We had a buffet lunch at Eurong Beach Resort and then went on a big walk up the amazing Hammerstone Sandblow to Lake Wabby which is also a great place to swim in. In the afternoon, we drove back to the harbour and took the ferry back to River Heads at 5pm. 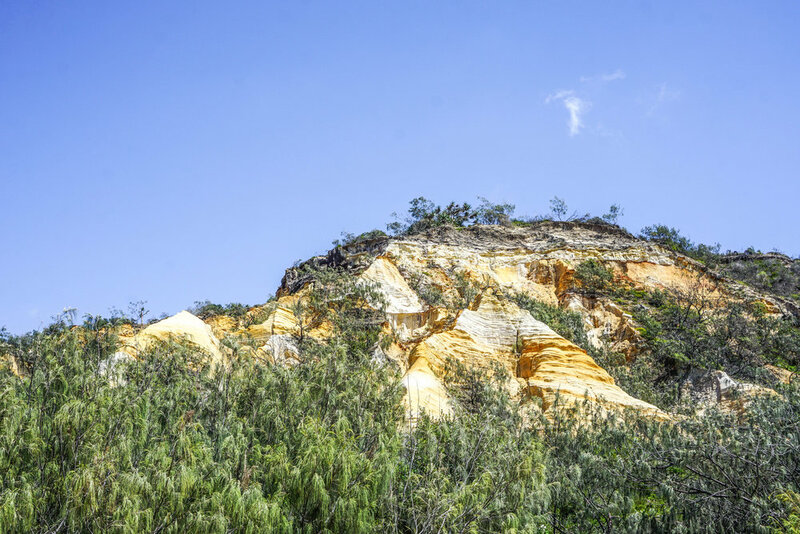 Has this post made you want to explore Fraser Island with Cool Dingo?